I am so thrilled to introduce you to two delightful little ones by the names of Baby Amandina and Juju Bunny. Spring brought them into the world and they've come upon us bringing good tidings for Easter and all the wonderful things to enjoy at this time of year (that is...if you are in the Northern Hemisphere). When the air gives off even the slightest hint of Spring it gets me hopping because I know it is that time of year when Father Spring comes out from hiding and brings us the gift of Easter, budding leaves, wild bunnies darting to-and-fro in our yard, and warm sunshine. As such I always welcome this time with jubilant arms for I love love love making bunny-related things. If you were around during this season last year, you might remember all the Spring cuties that entered our lives...Ostara and Paschal, Skye and Poppy, Pip and Goosey Mae and all the other wonderful wee-ones. There is something about bunnies that brings timeless love. Everybody loves bunnies. They bring good cheer during Easter. They have the cutest button noses, curious brown eyes and the dearest little whiskers. They are small, fluffy, furry, soft. They are beloved characters is books, stories, myths. These little rascals have won the hearts of humans for time unknown. No wonder I love thinking about them, watching them in our yard, making them and holding them. 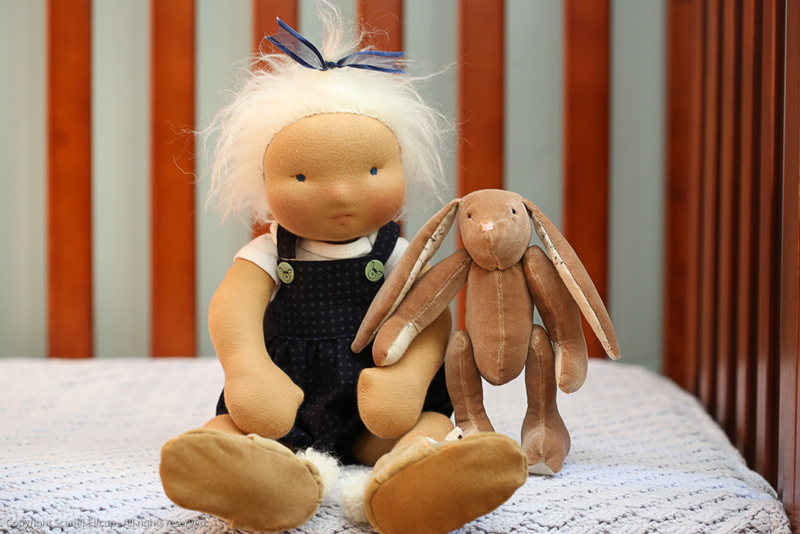 This year, Baby Amandina and Juju Bunny are the first to be welcomed into the world by Spring. Oh, this sweet pair! I don't think they'll go anywhere without one another. 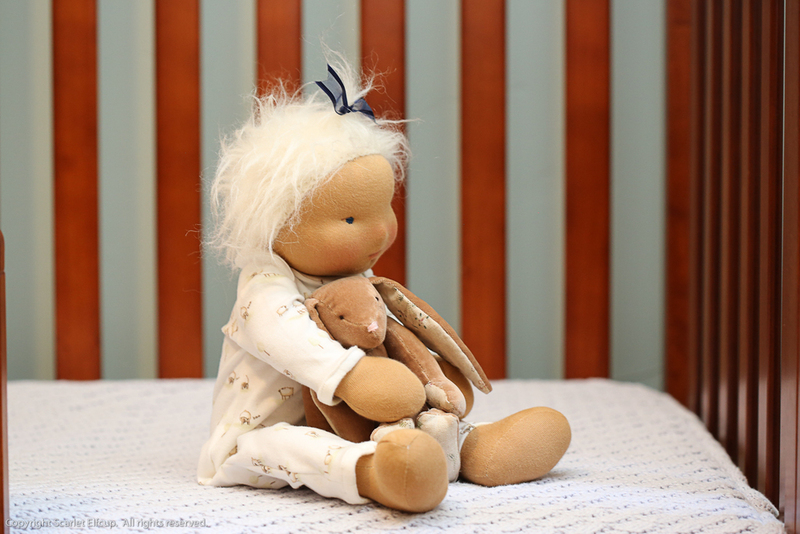 Baby Amandina's Juju Bunny is more than just a favorite toy bunny. Juju Bunny is Amandina's everything. ...and best of all...they are there to give comfort and hugs to one another in times of need...that's what pals do. Baby Amandina is a 16" Baby Elfcup. 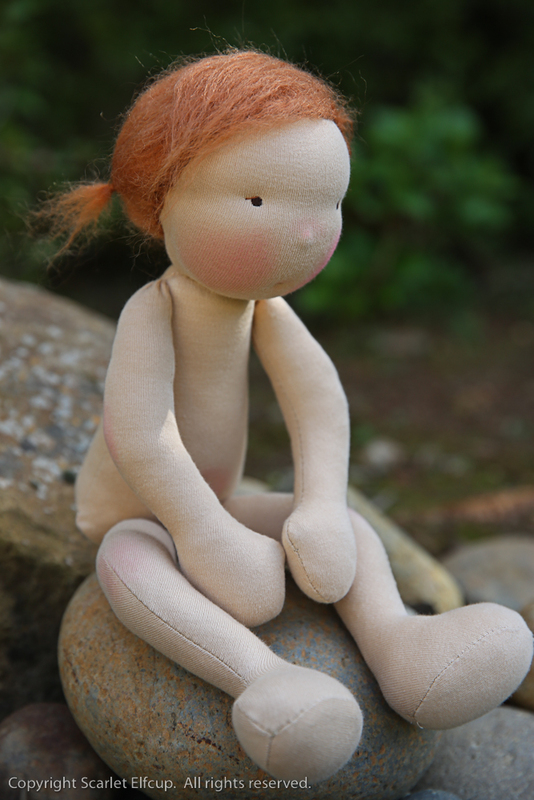 She is created from Scarlet Elfcup's 16" Baby Pip pattern. 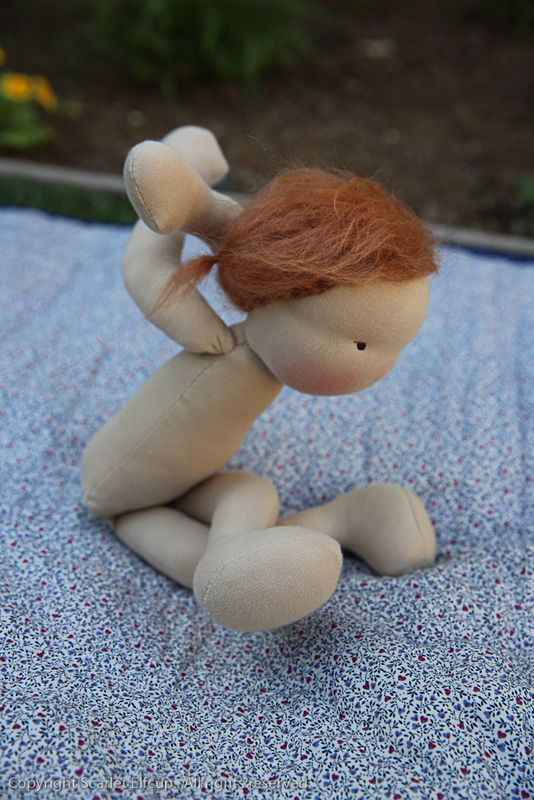 The 16" Baby Pip was created with a very special child in mind...designed to be limber, long, lanky and very small in the torso so that the doll could be slung and handled by a toddler's tiny hands. Baby Amandina on the otherhand was created with a modified Baby Pip torso...a torso that is wider and a bit chunkier...something to give a tiny bit of heft to the baby. Her feet are also modified so that it is more proportional to her body and does not have the effect of an exaggerated foot size...makes for a lovelier time in creating her shoes. Finally, a small adjustment to the arm length was created in order to give a more accurate proportion of baby arms...shorter and not so long and floppy. Other than that, Baby Amandina's construction is the same as that of the 16" Baby Pip. I haven't quite decided yet how I want the final 16" Baby Elfcup pattern to sit, but for the time being, this one will remain as a fun and floppy doll. Baby Amandina measures approximately 16" (40 cm) long. She is made with all natural materials. 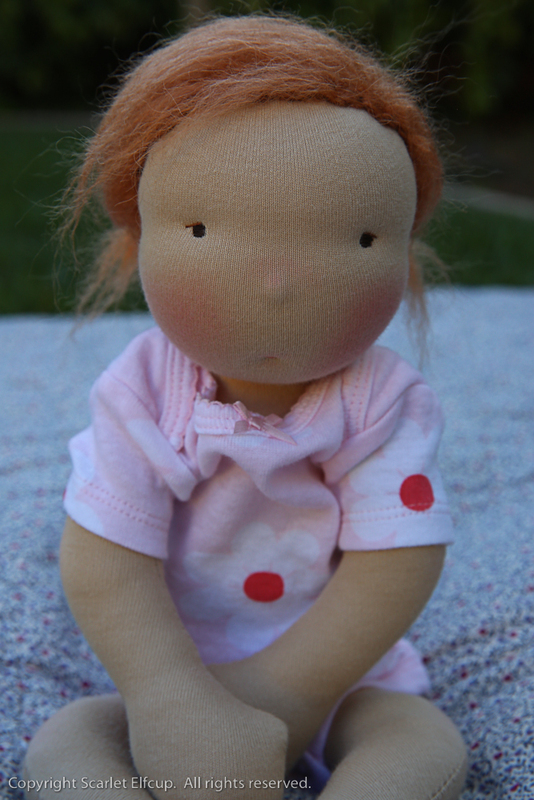 Her doll skin is made with premium quality cotton interlock milled in the USA. She is firmly stuffed with bio-wool. Her seams are sewn twice for reinforcement. 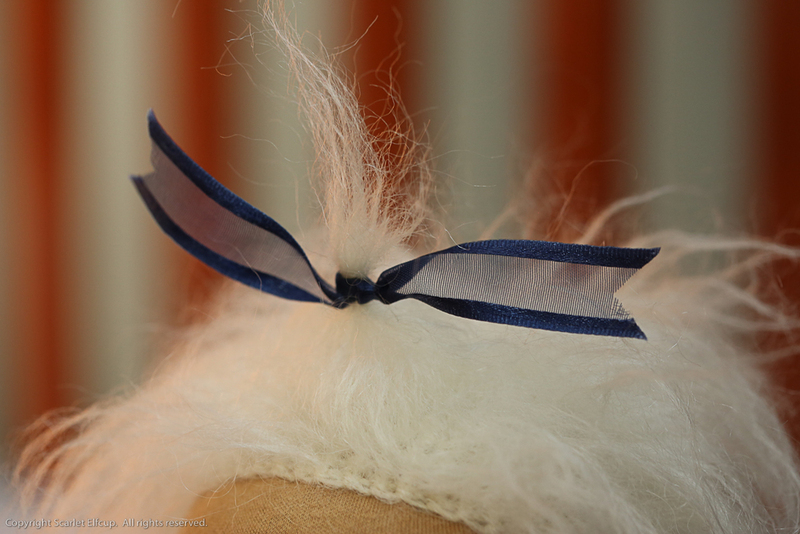 Her locks are made of mohair yarn tied "baby-style" at the front with an organza ribbon. She has a lightly sculpted facial structure and cotton embroidered facial features. Her cheeks, nose and various body parts are blushed with red beeswax. She has a belly button and a bum. 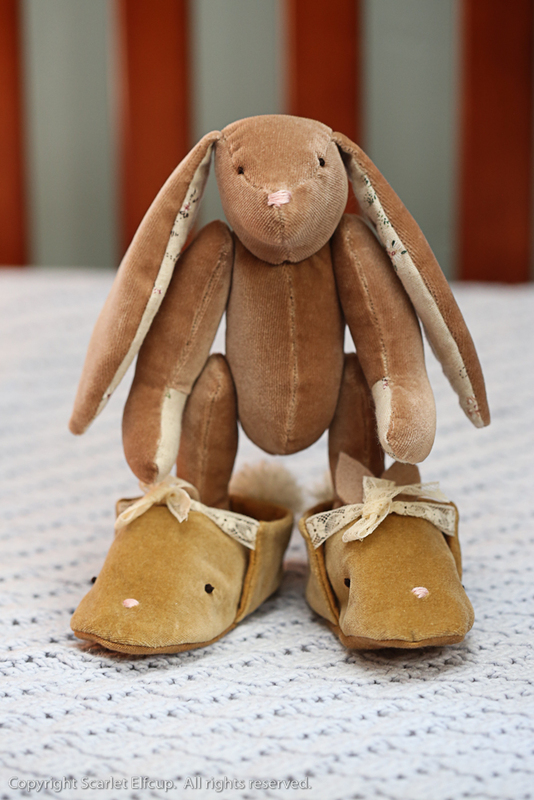 Baby Amandina comes with a play outfit and a sleep jumpsuit and a pair of the sweetest bunny shoes made from the best quality all natural vintage fibers. Baby Amandina's play clothes is fit for an Easter outing. The white baby suit that she wears under the rompers is a brand new, pre-washed 100% cotton baby onesie. She'll go out frolicking and rollicking on Easter with her dashing blue rompers. The rompers are made with a gorgeous 100% Japanese cotton fabric and lined with a 100% cotton floral print. 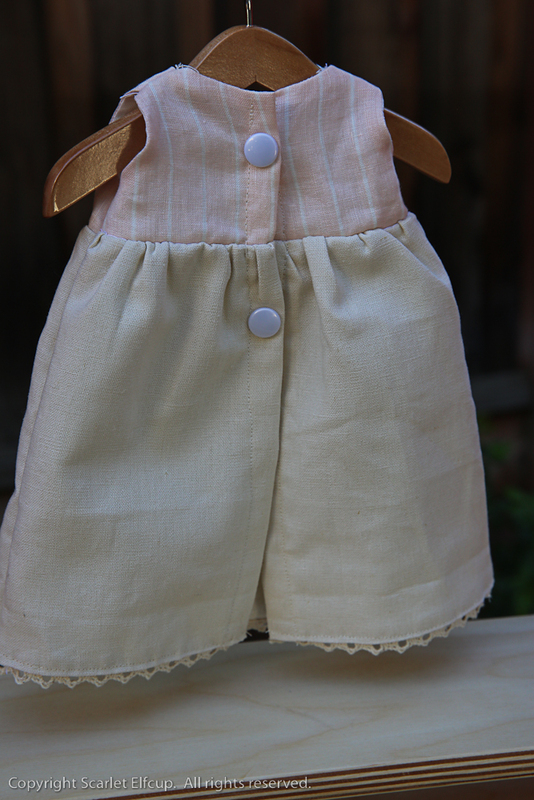 The rompers were stitched to fit her just right and has beautiful functional bunny buttons attached to straps that cross on the back. At night Baby Amandina snuggles up warm and cozy in her sleep jumper. The jumper is made of 100% cotton interlock. Baby Amandina's Easter shoes...I wish I had one! Baby Amandina's shoes are made from three different fabric textures composing of 100% cotton velvet and 100% cotton...embellished and trimmed to the nines. The lining and the soles are made of a 100% vintage cotton fabric. And the outer shell is composed of a 100% vintage cotton velvet. The shoes tie closed with a delicate and gorgeous 100% Swiss cotton lace. 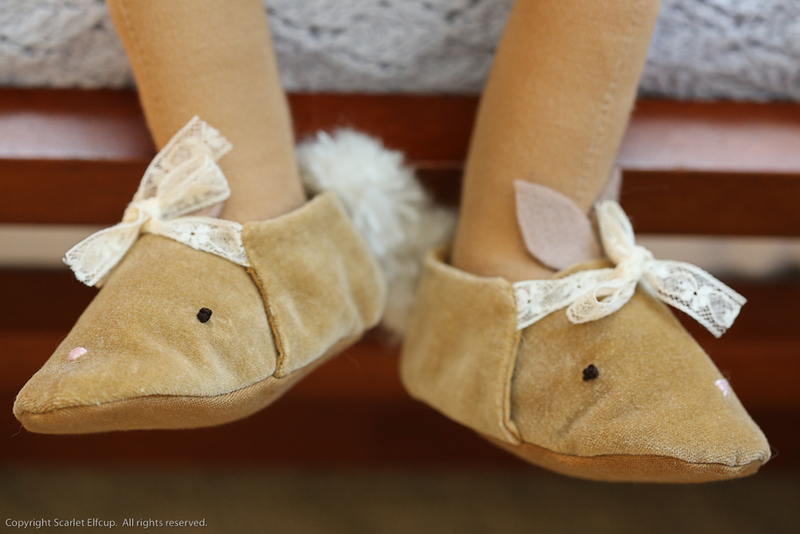 The top and the back of the shoes are embellished with bunny parts...bunny eyes and nose embroidered with 100% cotton floss, bunny ears are made of 100% Belgian wool felt, and the very soft and fluffy bunny tail is made from 100% suri alpaca yarn. I love working on pattern creation. Slow but enjoyable and wonderfully gratifying are the things that come to mind when I think of this process. In the past year, I've come to fiddle with a few soft animal designs and I've loved each pattern that's come and stayed...the hummingbird, the megaloceros and now Juju. Each was created with an endless number of hours sketching and scratching, sewing up the mock-up and restarting the process numerous times before I am finally satisfied with how the puzzle fits together. Pattern making is challenging and fun...it's a puzzle with math and art combined. There have been pattern making projects that I attempted in the past, utterly failed and have left to collect dust until I can be inspired to come back and take a look at the problem solving with a fresh eye...the gypsy moth project was one of these. It's been nearly a year since I started this project then left it to sit. It nags at me. I tugs at me all the time. But, I know that when I come back to this one, I'll be able to pick it up and create something that is way off the path from my original idea, but will be just as deeply inspiring and gratifying. And this is part of the wonderful journey of creating your own patterns. So, now back to Juju. I wanted to make a bunny for Baby Amandina. I wanted the bunny a size that is playful for Amandina and I wanted the bunny to have a vintage look. So, all these desires played into the design of the pattern. I won't go into the details of Juju's pattern design today...that will be left for another day. Today, I want to give Juju all the attention. Juju measures approximately 8" (20 cm) long. 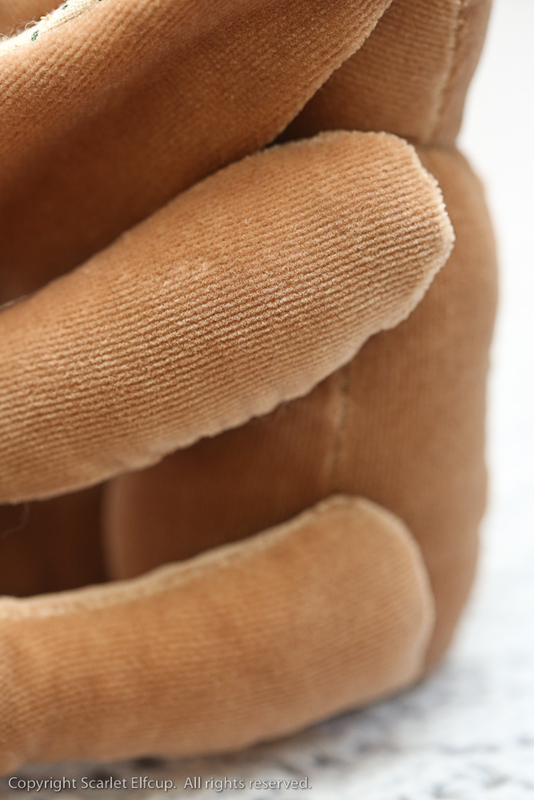 The bunny is made with all natural materials. Juju is made with premium quality 100% cotton corduroy velvet. 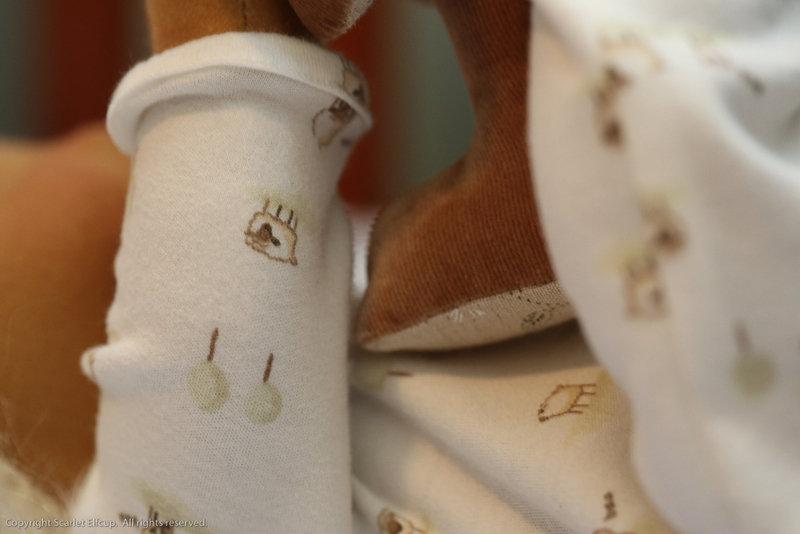 Juju's ears, hands and feet are lined with a beautiful 100% cotton linen fabric. Juju is stuffed with bio-wool. 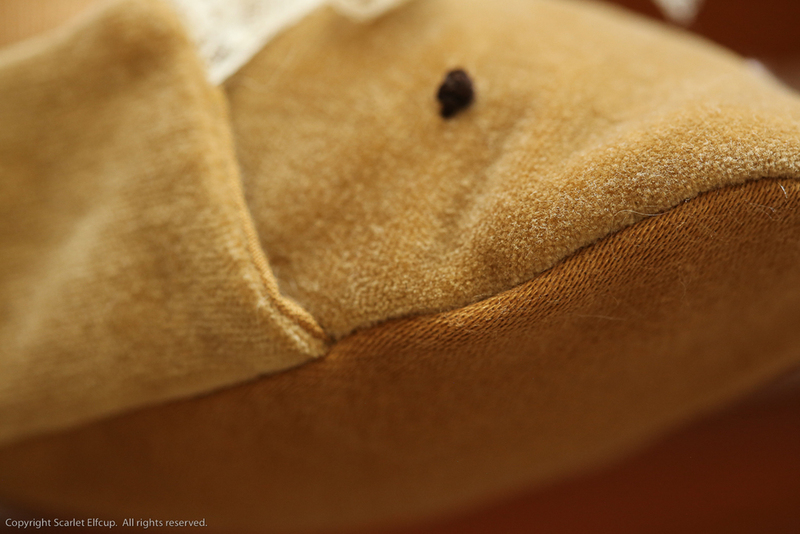 Juju's eyes and nose are embroidery with 100% cotton embroidery floss. The arm and legs are string jointed and are not designed for rough play. Baby Amandina and Juju Bunny...a gift brought forth by Spring. This duo will be up for a live auction at a local fundraising function on Saturday, March 12, 2016. I'm sorry the blog has been so quiet. I've been busy bringing a baby into the world. Her name is Amandina, born February 24, 2016 at 4:10 PM, 16" (40 cm) long, 1 lb. 1 oz heavy. More of her in the coming week. Stay tuned and enjoy the rest of your lovely day. Scarlet Elfcup is proud to welcome a big baby into the Elfcup family...a baby pattern, that is. Last week, you were given a sneak peak of Scarlet Elfcup's newest pattern presented in a custom creation of Pip & Goosey Mae. 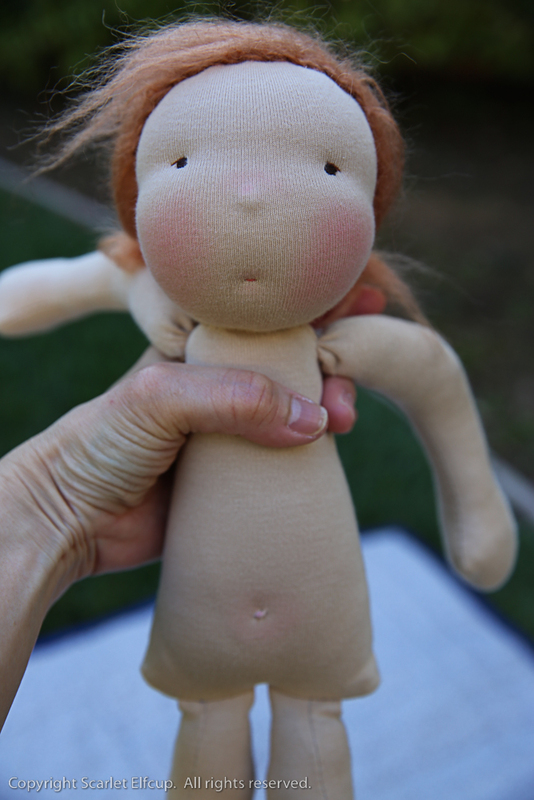 Today, I am proud to introduce to you the 16" Baby Pip, a large 16" doll pattern. Out of character for a Scarlet Elfcup doll comes a doll of the large variety. It has been a very long time since I've made anything larger than an 8" doll. 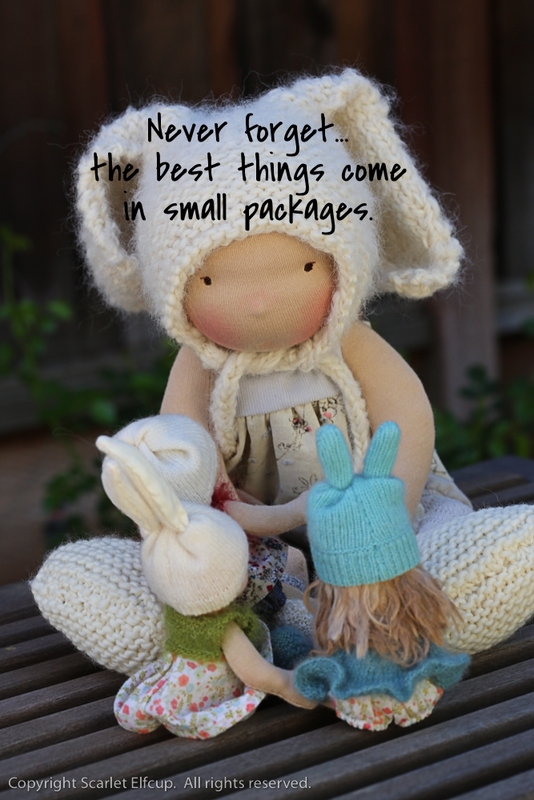 My hands are so smitten with the tiny dolls that I can't seem to leave them and had it not been for Little Pip who came to life for a little girl I really love, I think I would want to say that there wouldn't be much room for dolls of the large variety in Scarlet Elfcup's world. But, I should know by now that we never say never. So, here we are...enter the 16" Baby Pip. 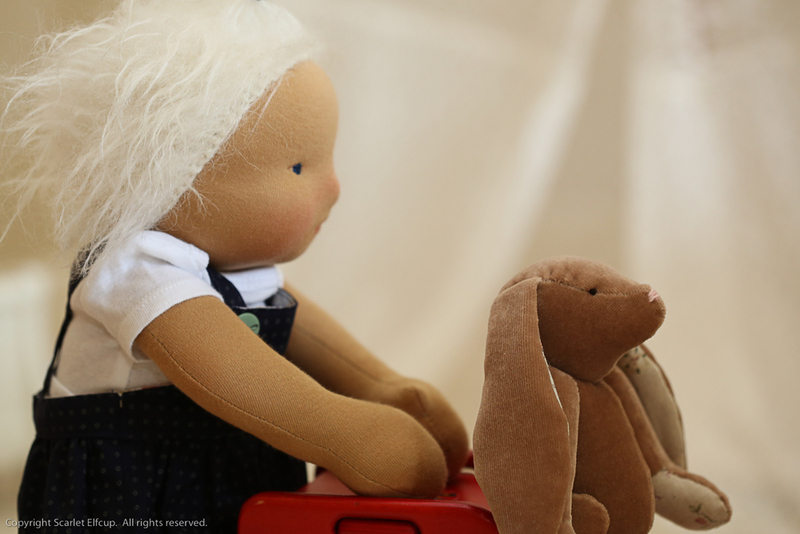 The 16" Baby Pip features a sitting doll that spans an enormous 16" (40 cm) long. The doll is designed to be big, long, lanky, limber and extra floppy. 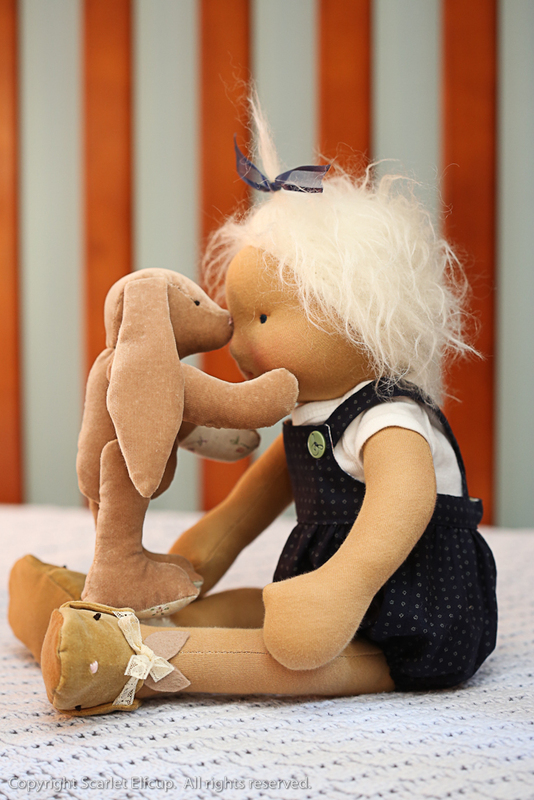 The 16" Baby Pip represents more of a fun, floppy doll than it was meant to represent any realistic features of a true human form hence you'll find that the arm length and legs are longer than the usual proportions found on a real baby or infant. The body is made extra slender in order to create a long, lanky, limber form. 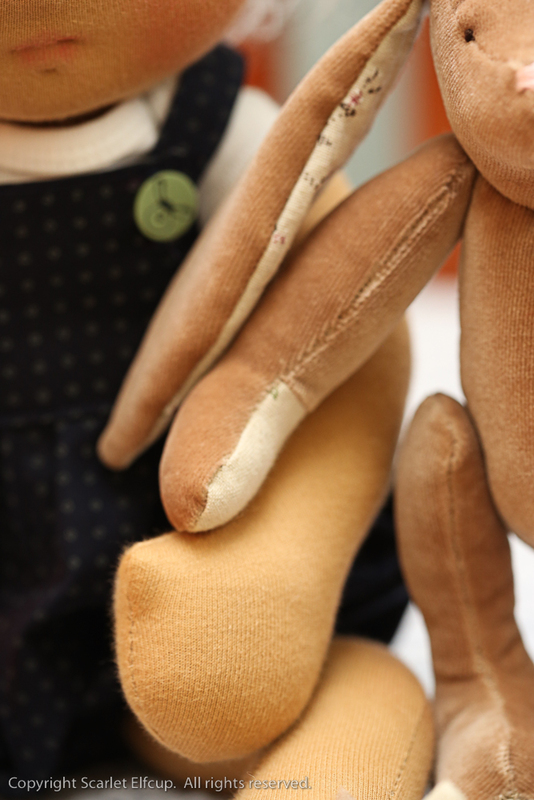 Therefore, the torso will nearly fit the circumference of the fingers and thumb encircled around the chest of the doll....just perfect for tiny toddler hands to wrap around. The doll's seams are double stitched as usual. The Baby Pip has details that include shaped feet (left and right distinguished), hands with thumbs, buttocks and a belly button. The leg proportion is extended a tad to give a long lean structure for the doll and it features the curved knee in order to allow for a very open sitting position, similar to that of young babies. The Baby Pips will come in a wide array of options in order to suit the needs of all ages. So, they will range from classic Waldorf facial features to heavily sculpted facial features. The hair will also span widely from mohair yarn, suitable for play by little ones to wefted wigs made from suri alpaca or any number of fleece locks, suitable for love by little ones at heart. The 16" Baby Pip....a big doll suited for play, hugs and snuggles and the one qualification that I like to keep for myself...a doll that still fits in the palm of the hand. Pip has a goose named Goosey Mae. Pip loves Goosey Mae. Pip doesn't go anywhere without Goosey Mae. But, mostly, they never go anywhere anyway because home is the best and happiest place. On the usual occasion you'll find Pip and Goosey Mae in their backyard, resting in the shade, on the lawn, watching the birds and the bees and the squirrels go by. They like to look at picture books. 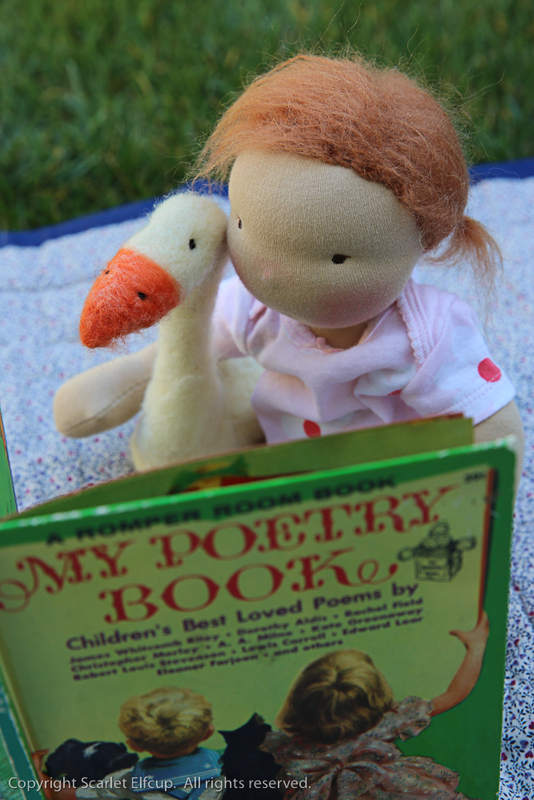 One day when Pip can read, she's going to read great works of poetry to Goosey Mae...fun and interesting reads such as Mud and Galoshes. Oh joy! Sometimes they even take naps on the lawn, in the breeze, in the shade. It's the best kind of heaven. What more to enjoy in life than this? I'm going to try and contain my emotions here while talking about Pip and Goosey Mae. In fact, I'm not even sure where to start. First off, Pip and Goosey Mae are made for a very special family....sweetest family I ever did meet, without having ever met in person. 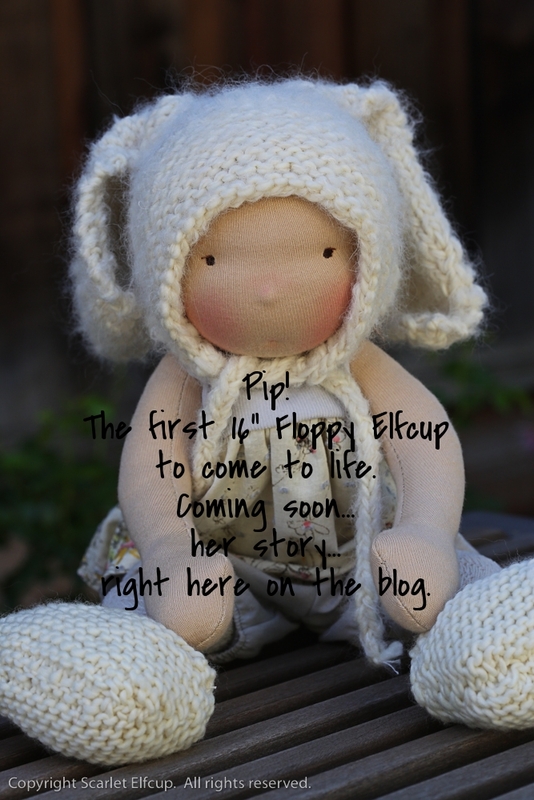 Pip was created and designed whole heartedly for one tiny precious tot that I have had the great pleasure of watching her grow day by day through amazing photographs her mama takes of her. It's been a year of watching this beautiful sweet child grow and change because that's how long I've known this family....essentially since the beginning of Scarlet Elfcup. How lucky I am that our paths crossed. When I was asked to create a baby doll for N, I was so thrilled. I haven't made anything larger than an 8" doll for nearly a year, I think. I have been so smitten with the 6" Wee-Bee Mini Elfcups that I just didn't think that I would ever go back to making anything much larger than that. But, when this request came up, I was so excited to be able to make something for N that I had to reconsider the larger doll. In doing so, I took a rather simplistic design that I had of a 14" doll....my first and only large doll pattern that I created last year....and decided that I would reconstruct and change a few things to make it more interesting....not for me, but for little N. So, now I present to you, Pip. Pip stands approximately 16" (40 cm) tall. She is made with all natural materials. Her doll skin is made with premium quality cotton interlock imported from Europe. She is firmly stuffed with bio-wool. Her seams are sewn twice for reinforcement. 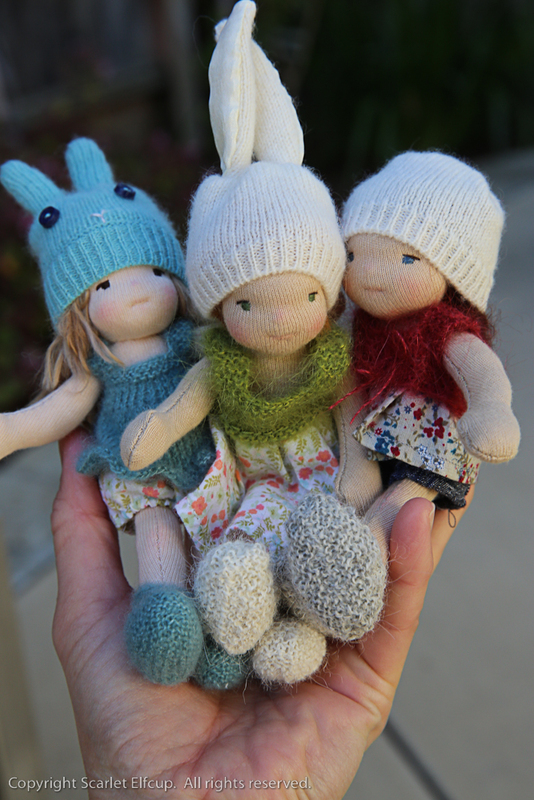 Her locks are made of mohair yarn tied into two adorable pigtails. The wispy look and the color of the hair were meant to reflect that of little N's very own wispy baby locks and beautiful brown hair. She has a classic Waldorf facial structure with only one minute element of adornment...a dash of embroidery above her eyes. Otherwise, her facial structure is created with the simple beauty of a classic Waldorf doll in order to allow N lots of room for imaginative play. She has embroidered facial features. Her cheeks, nose and various body parts are blushed with red beeswax. She has a belly button and a bum. 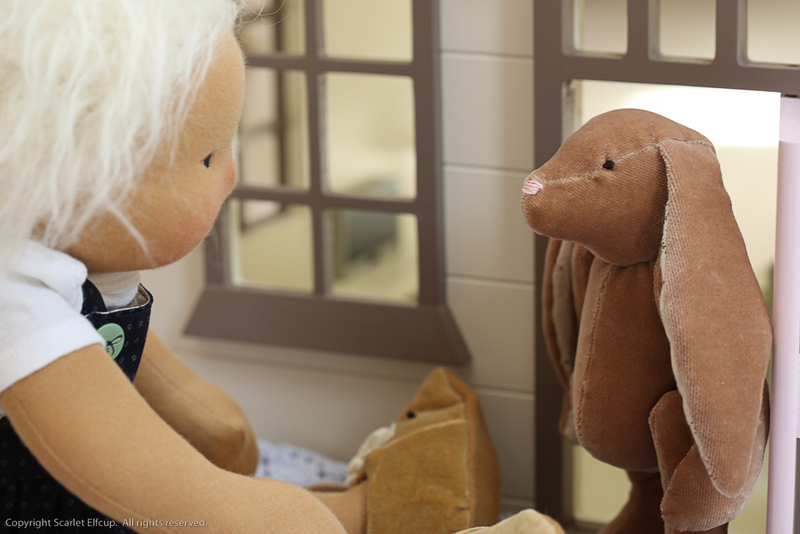 Pip comes with an enviable wardrobe, created for the youngling who enjoys changing of the diapers and dressing of the dolly. An Easter outfit....yes, yet another knitted bunny hat. I guess Easter has been on my mind for the past month considering that almost every doll I've created since the end of February has had a bunny hat of one kind or another. When she goes home, Pip will attend a birthday party dressed in her best, a sweet cream, pink and linen dress lined at the hem with cotton lace. The dress opens fully on the back with two snap on buttons. Underneath she'll sport a pair of linen bloomers lined with elastic lace. Her shoes are hand knit with a chunky Malabrigo merino wool yarn. Her bunny hat is hand knit with a Malabrigo merino wool yarn held together with a suri alpaca, merino and bamboo blended yarn by Blue Sky Alpacas and reverse stockinette stitch knitted to give the warm fuzzy look. A play outfit. The top is made from corduroy and a beautiful lightweight floral cotton print. The top opens fully on the back with snap on buttons. Her precious but simple bloomer pants are made from a 100% lightweight cotton. An outfit perfect for running around in the sun. 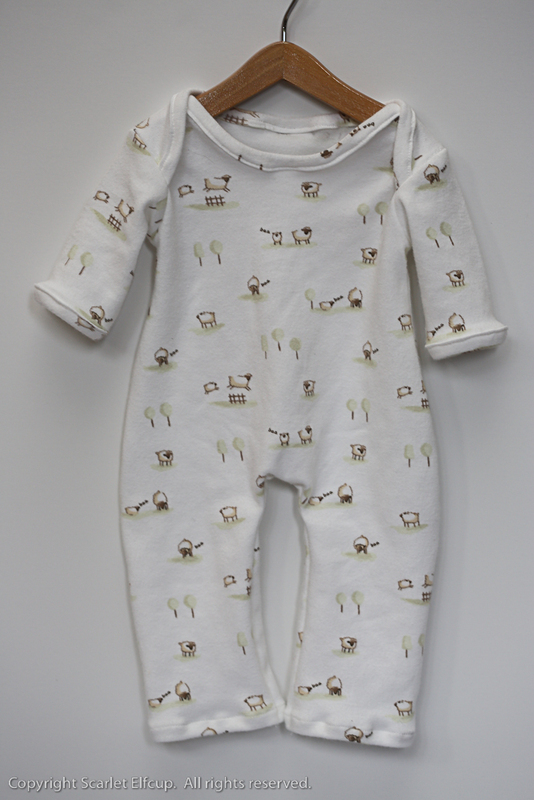 A brand new, store bought, clean and laundered onesie with floral print made of 100% cotton. A pair of dolly stockings and a pair of dolly socks made of a cotton and synthetic fiber blended material. Two pairs of diapers made of 100% cotton, lined with a polyester/polyamide material to give a fluffy, bulky look to the diaper and sealed with velcro. Pip comes cuddling Goosey Mae. Goosey Mae is a very personal creation, made because N's mama often refers to her as "goose" or "goosey mae." 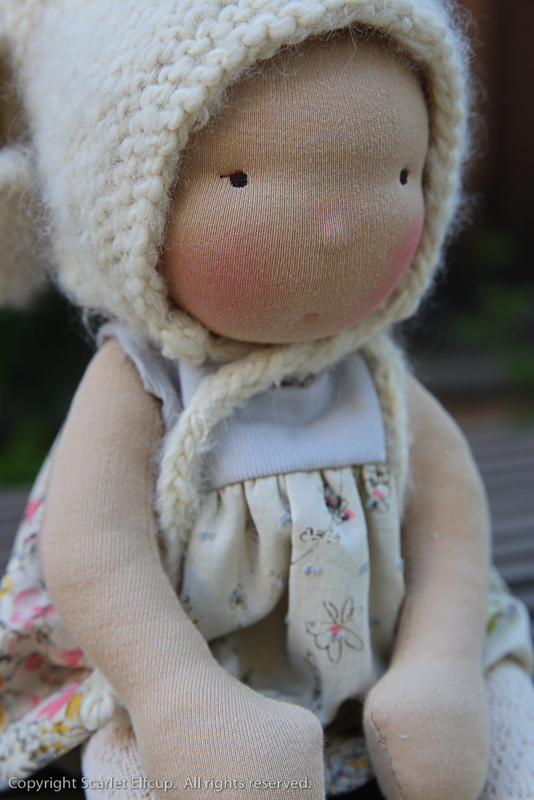 Sweet Goosey Mae is needle felted with 100% wool roving and stands 7" (18 cm) tall....made just for N and her mama. Pip and Goosey Mae, everyone.....made just for sweet precious little N and her sweet precious amazing mama. There's been lots happening around here. I apologize for the bombardment of posts and updates. There are a few other bits of news coming in the next couple of days. So, instead of constantly feeding to the social media posts, I'm just going to give a brief summary here and if you're interested, you can simply come back to the blog to check in on things. And lastly, enjoy these fun photos of the girls saying good-bye to one another. Ooohhh! So cute! I'm envious of all the mamas who have these sweeties coming your way. I want to keep the whole brood. Ha. (....well, actually.....it's one little dolly and one big dolly)....waiting their turn.